I am rather disappointed that the teaser trailer I posted below seems to have been taken down by Disney. I have never upset Disney before, and I certainly don’t want to start now. As a way of making a mends, I’d like to take a few minutes to talk about another Disney gem that I recently rediscovered: The Adventures of Davy Crockett! The boy and I watch the original film the other night and I really thoroughly enjoyed it. It made me feel like playing Cowboys and Indians in the backyard like I used to with my brothers. 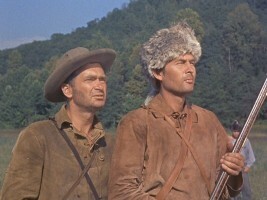 And donning a coonskin cap like good ole’ Mister Crockett! However the boy wasn’t so impressed…I guess it’s one of those things you have to see whe n you’re younger to really feel the true excitement. Also, there were a couple shots with Davy and a crocodile that are just hilariously bad! I totally didn’t remember that part. They edited together nature documentary stock footage, with the Davy Crockett footage and it is so off, incongruous and campy it makes me love it even more! Plus, that song! Born on a mountain top in Tennessee….I could go on and on, but I will spare you all. But to top it all off: Davy himself, Mister Fess Parker, now is in the wine business and sure does make some tasty vintages! Grab a bottle and reminisce with the King of the Wild Frontier!